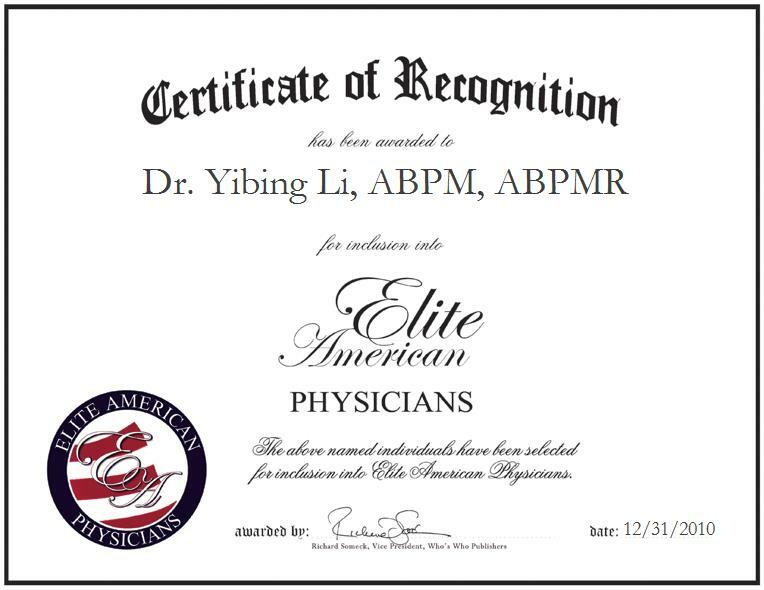 Peoria, Illinois, December 31, 2010, Dr. Yibing Li has been recognized by Elite American Physicians for dedication, achievements, and leadership in physical medicine. By remaining open-minded and employing her training in both eastern and western medicine, Dr. Li has separated herself from her colleagues and become a forerunner in her industry. With more than two decades of experience as a health care provider, she has developed an expertise in pain management, electrodiagnostic studies, physical medicine and rehabilitation. Whilst working at the Center for Pain Management & Rehabilitation, SC, she is responsible for acting as the medical director and chief executive officer of the facility. Likewise, she coordinates with primary care physicians, orthopedic surgeons, neurosurgeons, and chiropractors on a daily basis to ensure fluency among departments and the progress of the facility as a whole. As for her interactions with the patients, Dr. Li’s main priority is to achieve a higher quality of life for every individual that walks through the doors. Dr. Li’s knowledge and dedication to medicine is derived from her upbringing in a medical household. Drawing influence from her parents, who were both physicians, she has been able to establish her excellent medical practice and solid communication skills. After earning an MD from Shenyang Medical College in 1992, she completed a PMR residency at the Washington University School of Medicine at Barnes-Jewish Hospital. In addition, she fulfilled the American Board requirements to become certified in physical medicine, rehabilitation, pain medicine, and small-pain-fiber NCS electrodiagnosis. “You must be a hard worker, be dedicated, and be passionate for your work,” Dr. Li advises those entering her field. A promoter of advanced medicine, she maintains her devotion to the industry by affiliating with the Illinois State Medical Society, the Peoria Medical Society, the American Medical Association, the American Academy of Physical Medicine & Rehabilitation, the American Society of Interventional Pain Physicians, the American Association of Sensory Medicine, and the American Association of Neuromuscular & Electrodiagnostic Medicine. Moreover, Dr. Li holds hospital privileges at Proctor Hospital, Methodist Medical Center, OSF St. Francis Medical Center, and the Center for Health Ambulatory Surgery. When she is away from her professional duties, Dr. Li enjoys reading and listening to music. Her caring temperament and desire to help others not only radiates through her professional ventures, but through her volunteer work as well; she frequently serves as a volunteer instructor of medical education. She also donates to various organizations. For more information about Dr. Li, please visit http://www.cpmrmed.com.